MIKVA, Abner Joseph, a Representative from Illinois; born in Milwaukee, Milwaukee County, Wis., January 21, 1926; attended public schools in Milwaukee; J.D., University of Chicago Law School, Chicago, Ill., 1951; admitted to the Illinois state bar in 1951; lawyer, private practice; United States Army Air Corps, 1944-1945; law clerk to United States Supreme Court Justice Sherman Minton, 1951-1952; member of the Illinois state legislature, 1956-1966; elected as a Democrat to the Ninety-first and to the succeeding Congress (January 3, 1969-January 3, 1973); unsuccessful candidate for reelection to the Ninety-third Congress in 1972; member of the Illinois State Board of Ethics, 1973; practiced law in Chicago, 1973-1974; professor, Northwestern University School of Law, 1973-1975; elected as a Democrat to the Ninety-fourth and to the two succeeding Congresses, served until his resignation on September 26, 1979 (January 3, 1975-September 26, 1979); judge in the United States Court of Appeals for the District of Columbia circuit, 1979-1991, chief judge, January 19, 1991-October 1, 1994; Counsel to President William J. Clinton, 1994-1995; died on July 4, 2016, in Chicago, Ill.
Papers: 1950-2010, 203 linear feet. The papers of former Congressman Abner Mikva contain correspondence, speeches, reports, newspaper clippings, newsletters, campaign pamphlets, questionnaires, surveys, press releases, financial papers, corrections reform legislation, gun control, ethics legislation, court cases, opinion slips, law clerk files and manuals, published articles and textbook, foreign travel, CEELI, American Bar Association meetings, teaching materials, awards, honors, and post retirement speaking engagements and related activities. The collection is arranged in five series: Legislative File, Congressional File, Court File, Personal File and Post-Retirement File. A finding aid is available in the repository and online. Oral History: 2014, amount unknown. Interviews of Abner Mikva were conducted by Mark R. DePue for the Abraham Lincoln Presidential Library. Topics discussed include Independent Democrats of Illinois; Adlai Stevenson II; President Bill Clinton; Mayor Richard J. Daley; Chicago Democratic Party machine; Illinois House of Representatives; President Barack Obama; War Powers Resolution of 1973; gun control; Governor Otto Kerner; Governor Richard Ogilvie; Hillary Clinton; Governor Dan Walker; Whitewater; Paula Jones; Cutback Amendment; Governor Jim Thompson; President Richard Nixon; 1968 Democratic Convention; Ken Starr; Waco siege; State Senator Emil Jones; and U.S. Court of Appeals for D.C.. Oral History: In the Historical Society of the District of Columbia Circuit, Oral History Project oral history interviews, 1991-2004, 2.8 linear feet. Interviewees include Abner J. Mikva. Audiotape Reel: 1974, 1 commercial on 1 audiotape reel. The commercial was used during Abner Mikva's campaign for the 1974 U.S. congressional election in District 10 of Illinois, Democratic Party. Mikva, Abner J. "Interest Representation in Congress: The Social Responsibilities of the Washington Lawyer." George Washington Law Review 38 (May 1970): 651-74. Mikva, Abner J., and Joseph R. Lundy. "91st Congress and the Constitution." University of Chicago Law Review 38 (Spring 1971): 449-99. Mikva, Abner J., and Patti B. Saris. The American Congress: The First Branch. New York: Franklin Watts, Inc., 1983. Ralph Nader Congress Project. 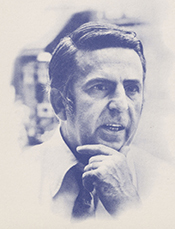 Citizens Look at Congress: Abner J. Mikva, Democratic Representative from Illinois. Washington, D. C.: Grossman Publishers, 1972.